So far the new year has been very good. The webinar wrap-up post is hitting solid good numbers and there are new subscribers to the newsletter frequently. Today I would like to share another About post with you. These posts are in depth and on a specific subject. 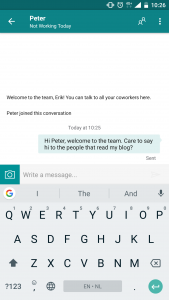 This post is about the application called StaffHub. 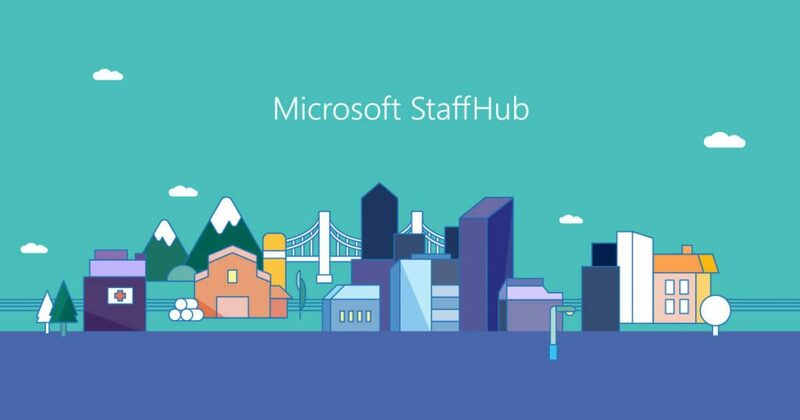 As we make Teams the hub for teamwork for employees in every role, Microsoft StaffHub will be retired on October 1, 2019. Learn more here. That was fast! But I kind of get the idea why Microsoft is stopping with the Staffhub service. It’s such a great product, but from a user perspective it’s just another app they need to open. If the one app they open on a day this needs to be Teams because of all the rich content and functionality. 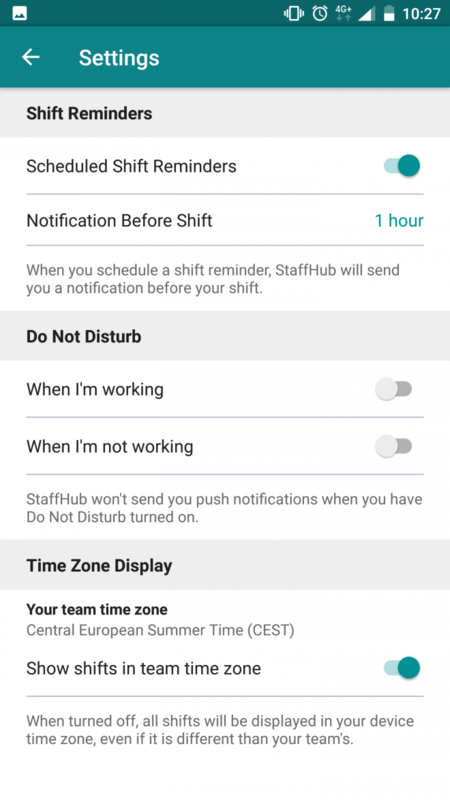 So let’s incorporate the Staffhub features inside Teams now the application is still in its infancy. Read on if you like to know more of the retired product called Staffhub. Or find some other content you might like on The Project Corner Blog. 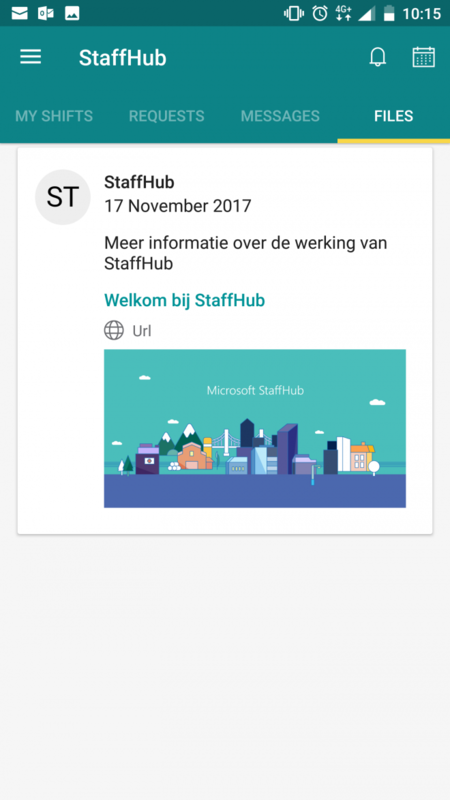 So, why talk about StaffHub here? The Project Corner blog is traditionally a place where you would find insights on Microsoft Project and Project Online. And there are even some posts focused on Project Management in general that are not tool specific. But then there are posts that discuss other tools, such as Excel, Planner and now StaffHub. The reason why I include StaffHub is because it fills a gap in functionality that tools such as Excel, Planner, Project (Online) can not fully support in a user-friendly way. This gap is managing shift schedules. StaffHub is build with the “Frontline workforce” in mind, this group of people work in the field and will not have direct access to a tablet, laptop or PC most of the time. The device most of these people do have? Their (smart) mobile phone. 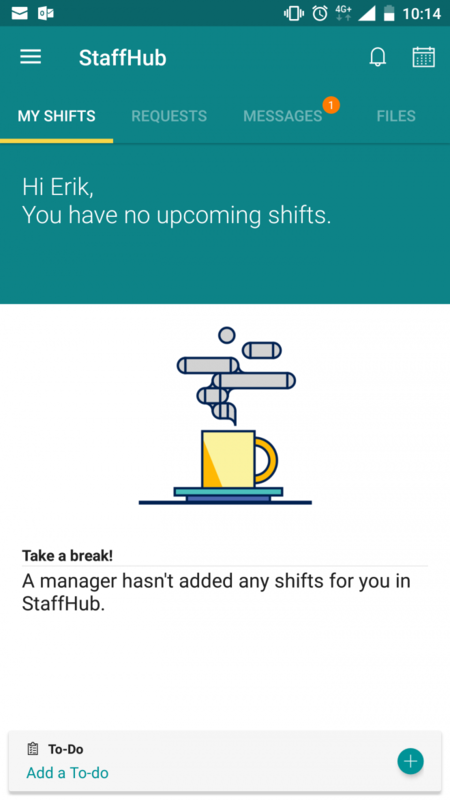 There are roughly two user profiles in StaffHub: The managers, and the workers. Both get their interface with the tool best suited for their needs. 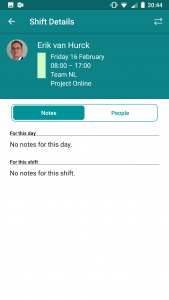 The managers will be able to create new “Teams” to assign work to. Normally you would like to do this by using a desktop browser. And workers get an interface that can be used from both a browser or the mobile app. Now, who is this application targeting? Roughly every company that has shift workers, or employee’s that need to perform work and do some kind of progress reporting, but will not be working from a desktop during working hours. Think about construction workers, shop employees, hospital staff, etc. 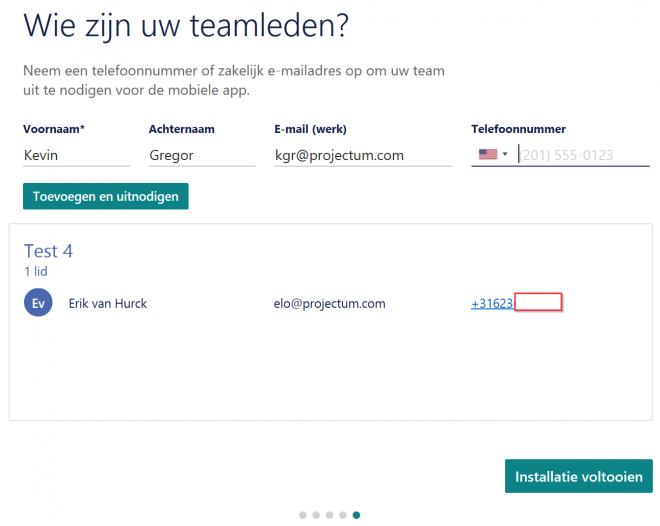 Currently StaffHub teams aren’t integrated with Microsoft Teams, so don’t confuse them. But that will probably change in the future. I’ll share a couple of screenshots about creating a new Team in the StaffHub browser interface. 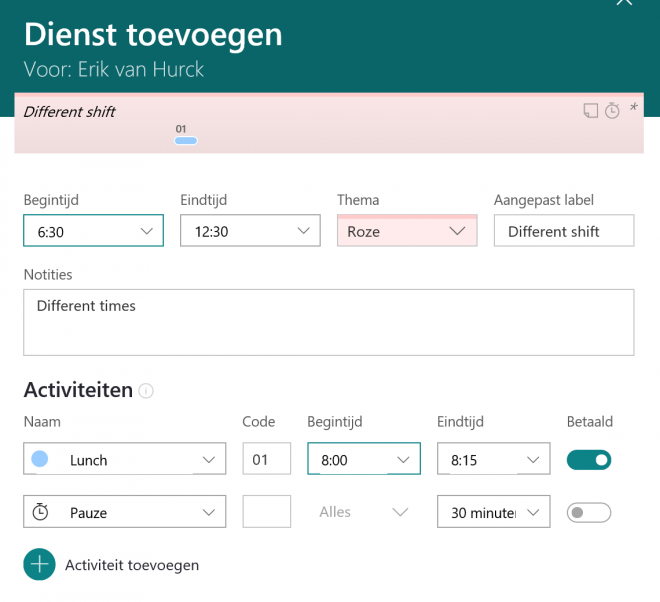 The tool actually translates the interface to the language settings on your machine, so these browser screenshots are in Dutch. Step 1: create a new team by providing it with a name. 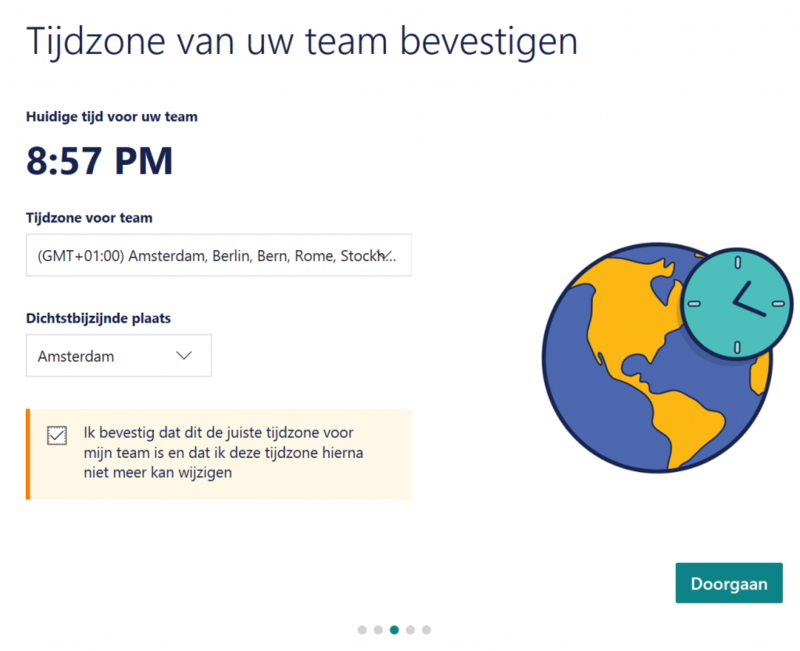 Step 2: Approve the timezone the Team will be set in. Step 3: Make your live a bit easier by downloading the mobile app. And just like that you are good to go. You just created your first team in the application. 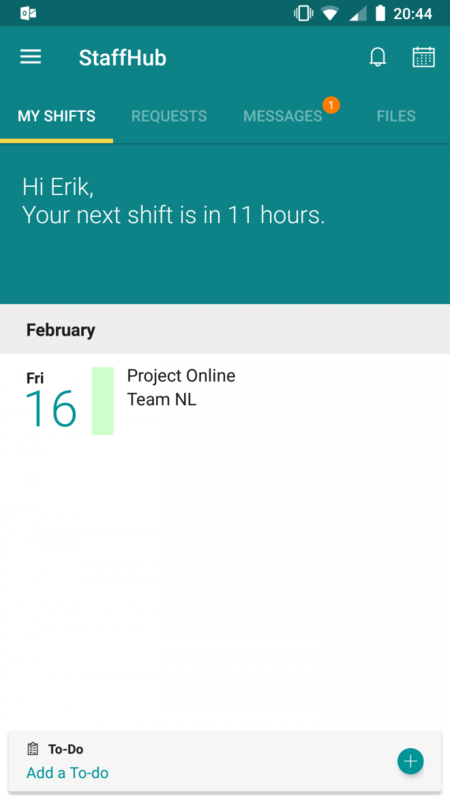 In the application it is very easy to create a shift or a number of shifts for the whole team using the week or month views. And once you created a week shift, that will continue on to other weeks, simply copy the week into the next. Shifts can start at certain times and can include unpaid/paid breaks. 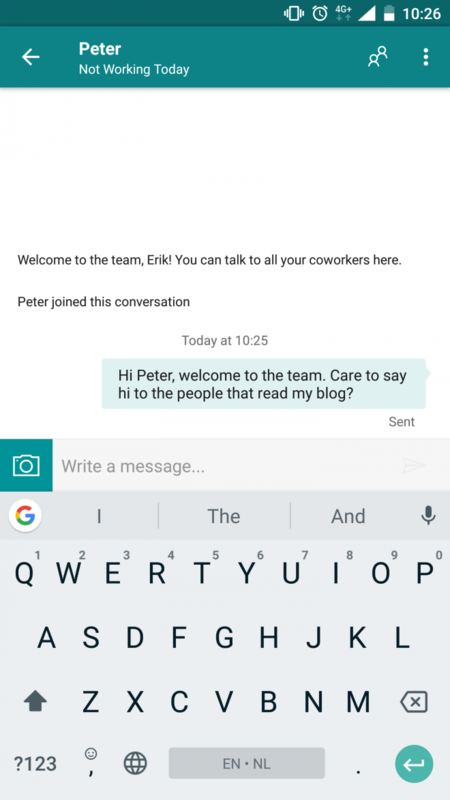 You are able to group people into teams as well as colorcode the shifts for a more user-friendly view. 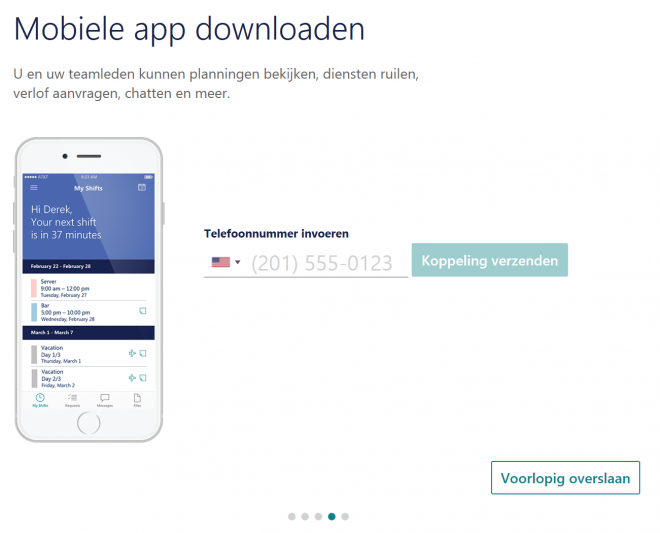 When you add a new person to a plan/team you get the option to include a mobile number. And that’s where the real charm is for me: the app sends a invite to the person to download the mobile app (only Android and Iphone, sadly). Now, I have my phone set to English. These screenshots will probably make much more sense. Click on the picture to enlarge it. If you don’t have any shifts in the team, you will have time for coffee :-). There is a “Messages” tab that tells you about the latest things happening in the team. Such as new members (Peter in this example). 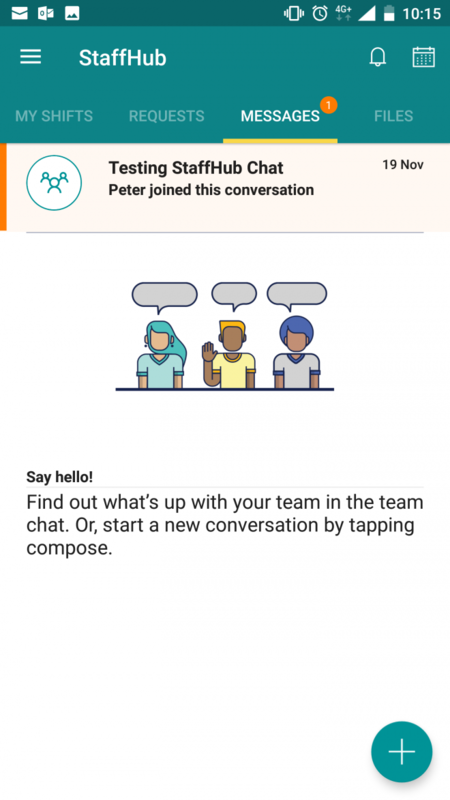 It’s also easy to start a chat session right from the app itself. There is also a “Files” tab that you can use to store all kinds of documentation or images (such as building blueprints). Once you do have a shift upcoming, it will show up in the tab “My shifts”. And it will also tell you when it will start. 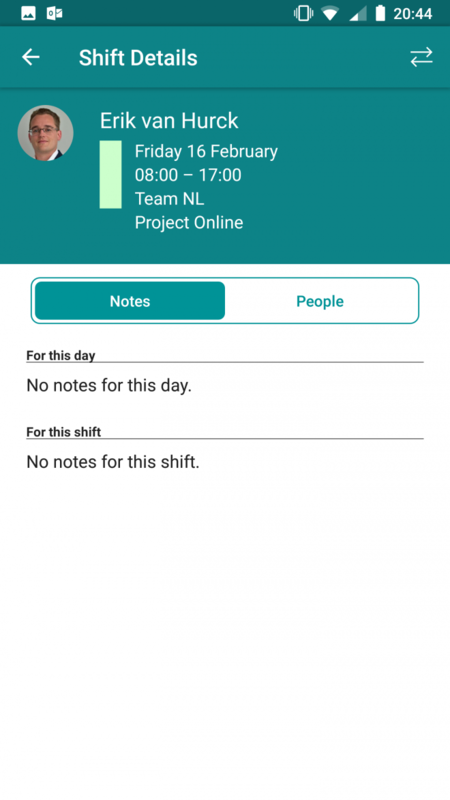 You can grab Shift details by clicking on the item, and the app will show you notes as well as other team members that will be on the shift with you. 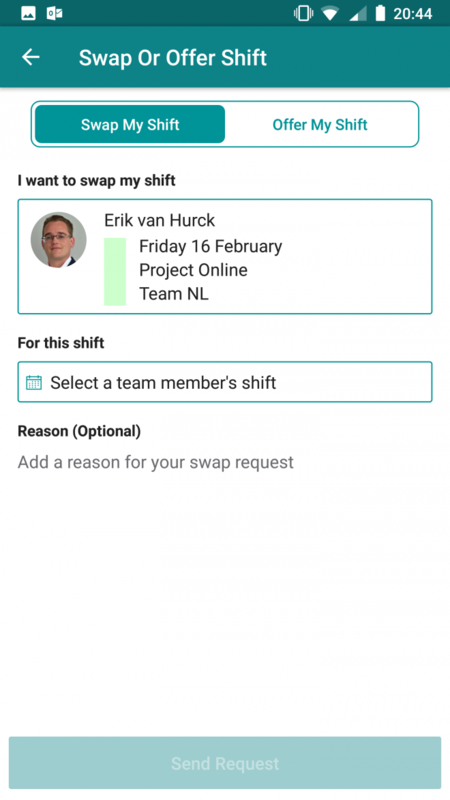 And then here’s a charmer… you can easily switch the shift with a teammember if you want to. 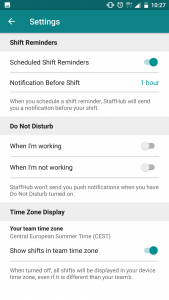 StaffHub is a application that’s relatively new. As such there are a number of things that can be improved. One of those things is integration with other systems. That being said, there is a API available. And that means that we can program against it to create interfaces for Power BI and Project Online. 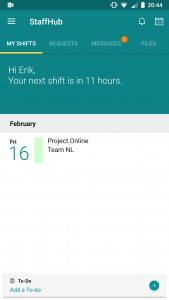 Just imagine: people report their progress using StaffHub right after or during their shifts (without difficult time sheets) and a link with Project Online will fill the actual work accordingly. Giving the PM a direct overview on how the project is progressing. Or maybe the person that would be most interested in this information is the line manager / resource manager that will see activity performed on line activities / administrative work. That’s it for me on StaffHub for now, but I might do a follow up post with more deep dive information or best practices. If you would like to see that post, let me know in the comments below. 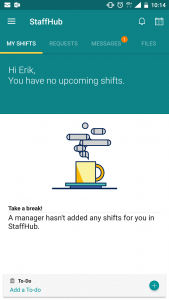 I hope you enjoyed reading about StaffHub. It’s been fun testing out the software. If you liked this post, please consider joining the newsletter I mentioned at the beginning to get updates from the field. Here are some other places you can learn more about StaffHub and what it can do for your organization.